PING PING PING PING | Awesomeness For Awesome's Sake. I started this post forever and a day ago…and it just kind of got away from me. 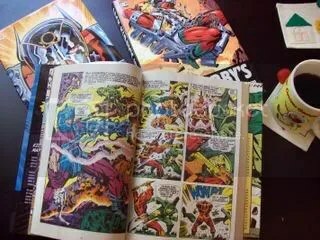 I had a thousand things I wanted to say about comic books and Jack Kirby, but I just couldn’t put it all together. I found myself spiraling away from the original intention of writing about Jack…I was linking to about 20 different blogs and web pages that highlighted The King and the many artists and writers he’s influenced…I had paragraphs about John Byrne and Grant Morrison, Marvel and DC, monsters and robots…the whole post just stopped making any sense to me. I’d come back to it and delete some stuff…add some new things…and delete some more…I’d read amazing blogs about Jack and decide I was just being redundant and edit out some more stuff and try to get more focused. Well, I’m sick of seeing it in my unpublished posts section…so this is all I have and I never want to see this post again. 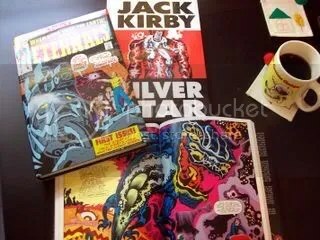 There is nothing better than some hot, black coffee and some JACK KIRBY in the morning. When I was just a little guy my Uncle Frank let me read his comic book collection when I was visiting Lynn in the Summer…that’s where I was introduced to all the Lee and Kirby Marvel Comics stuff. Uncle Frank had tons of Marvel titles but only a few DC books, so I wasn’t exposed to Jack’s 70s stuff until I got older….much older. This guy knows quite a bit about Jack. KIRBY’S GREATEST HELMETS PART 1! More Kirby than you could shake a MEGA-ROD at right here! I’m hoping they make with a Demon collection. Lately, I’m into this writer, Don McGregor. He did Killraven and some cool Black Panther stuff I’ve been reading. Check out his wiki entry. « Need More Fiber? Try Making Your Own Bread!